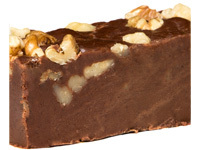 This recipe was prepared by George Steel of the World Famous Steel's Fudge located on the Atlantic City and Ocean City Boardwalks at the New Jersey Shore. Steel's Fudge is the longest family-owned fudge business in the United States, selling candy since 1919, and they can be contacted via the Internet at steelsfudge.com. Sugar - 1 ¾ lbs. Cook ingredients in a pot until they reach 235 / degrees softball. Pour the ingredients in a pan that sits over ice and water. Pour into a bowl and then stir and mix until creamy. Add walnuts and top fudge with nuts to complete the recipe.